The Walking Dead finally returned us to the Hilltop with Sunday’s “Go Getters,” in the process mounting one of the more inventive action scenes of zombie carnage in several seasons. The staging itself left more than a few fans scratching their heads by the end, for which star Tom Payne now reveals that several sequences were missing from the final cut. The scene in question began with Sasha and Maggie waking in the middle of the night to a blaring car stereo in Hilltop’s center, flanked by an open gate, several fires and walkers pouring in. It took the combined work of Sasha, Jesus, and Maggie in a tractor to finally silence the rolling walker beacon, but you’d be forgiven to wonder how we got there in the first place. Payne did clear up a couple of things that were not readily apparent in the episode. He said the Saviors were able to do what they did by capturing the Hilltop guards (who don’t have guns) and tying them up. That scene was shot but the editors didn’t like it after the fact. (“It looked like a barbershop quartet all strung up,” he said.) 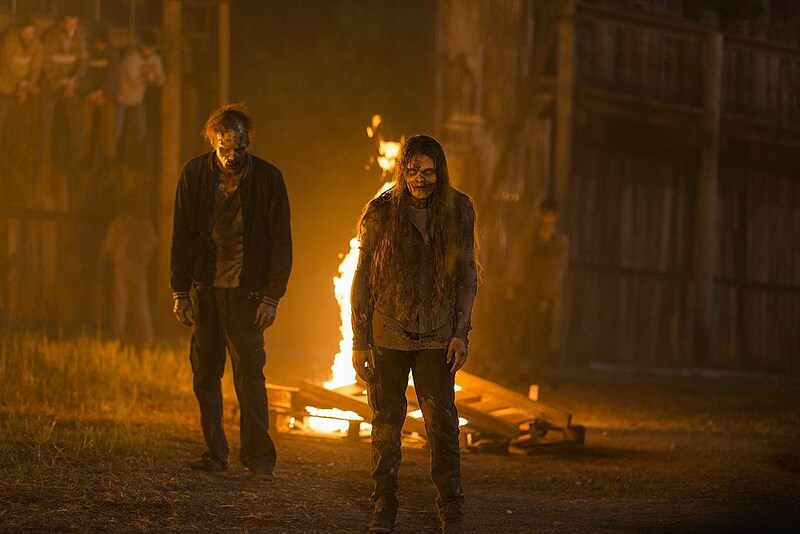 The Saviors also locked all the residents inside their homes to make it more difficult for them to deal with the walkers. Plus, most of the Hilltop residents are not trained to fight. So Simon, the Savior leader/Negan understudy, was genuinely surprised when he came back the next day and found everyone alive and well and the walkers all gone and cleared out. The visual of Maggie mowing down walkers in a tractor more than made up for any confusion in the moment, but it’s at least of interest that “Go Getters” opted to tighten the pacing, where other episodes run notoriously long. It isn’t clear how much more time we’ll get to spend at the Hilltop anyway, given that three episodes remain in 2016, one of which will spend time catching us up with Heath and Tara. In the meantime, check out the trailer for Sunday’s “Swear” below, and stay tuned for the latest.